What Services Does IT Recycles Provide? The team at IT Recycles is always here to offer each customer efficient recycling solutions and IT Assets Management. Through our wide array of services, we will ensure an optimum level of security and confidentiality. When you choose IT Recycles, you will get a partner who complies with all industry standard regulations. Because of our wide range of services, IT Recycles currently serves over 6000 customers in US and has 10 employees in the greater Boston area. Our experts are always here to help answer questions through the re-purposing and recycling process. We will ensure that all devices are accounted for throughout the entire recycling process. We can assess devices for reuse and resale. We will ensure that all data is destroyed. This service can be performed on your premises or at our secure processing facility. We always provide secure and safe data disposal with our risk-free data destruction service. We are happy to pick up any items at your location. Our team also offers events where you can drop off devices for recycling. We offer real-time reporting throughout the entire recycling process, from receiving to dismantling to recycling. No matter what type of IT asset you need to get rid of, our team can quickly and properly recycle it for you. Which IT Assets Can I Recycle? The team at IT Recycles has the expertise and experience to deliver the reliable and risk-free IT asset disposal and recycling services listed above. We are also able to provide these specialized IT disposal services at an affordable rate, giving each customer an effective solution for your IT asset recycling needs. 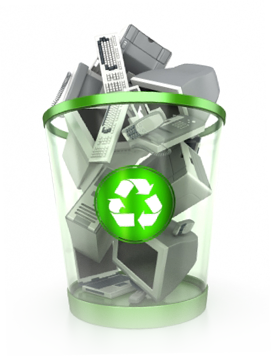 Why Should I Choose IT Recycles for My IT Asset Recycling Needs? IT Recycles is completely committed to providing the ideal recycling solution for your business. Our services are extremely flexibility and can be perfectly adopted to fit your business’s needs. Each of our skilled team members can provide professional and creative solutions for you. Our wide range of services are always aimed at maximizing your ROI and reducing any risks that are associated with data security and the proper recycling of excess or obsolete IT equipment. IT Recycles is proud to offer companies and organizations the flexibility and ease of managing large quantities of electronics with a tailor-made program that will meet all business needs. We work primarily with EPA-registered and regulation-compliant downstream partners to ensure we meet the highest possible standards of environmental protection and are fully conformed to all applicable federal, state and local regulations. What are the Benefits of Recycling My IT Assets? Help Your Community – Though your old electronics may no longer meet your businesses’ needs, they may meet another’s. Some IT assets can be repurposed and benefit your local community rather than ending up in a dump. Minimize Hazards – Many electronics contain harmful substances, such as lead and mercury, which can cause health risks. When electronics are properly disposed of, these harmful chemicals will not pose a risk. Recycling Reduces Waste – Did you know that nearly 2 million tons of electronics are thrown away each year? This is a massive amount of waste to fill landfills around the world. If you choose to recycle, you can help drastically reduce this excessive amount of waste. Return on Investment – With our IT Asset Refurbishment services you have the option to resell your unwanted electronics and re-gain some of your investment. The above are only a few of the many benefits you gain when you choose to recycle your unwanted or old IT assets. When you reach the end of your IT asset’s lifecycle, you must determine how to effectively protect any sensitive data as well as dispose of the unwanted machine. Luckily, IT Recycles offers a wide range of services that can help you accomplish both of these tasks quickly, easily and affordable. If you are interested in securing and destroying your data and/or disposing of your unwanted IT assets, contact the team at IT Recycles today!